It has been a real long while since I last had laksam. "Absence makes the heart grow fonder"... there's so much truth in that saying when it comes to many aspects in life, but probably just not so much with food. It wasn't until I came across Gertrude's from My Kitchen Snippets on her post on the Malaysian Food Fest (MFF) Kelantan Month that had once again stirred all the memories of everything Kelantan-related food in me after all this while. Browsing and reading through her post, it felt like a walk down the memory lane - of all the family gatherings my dad's side of the family had had in Kelantan back in my younger years and particularly of the many years dad spent working in the state up North along the Peninsular East Coast, away from home. My appreciation (with some curiosity) for the diverse cuisines in Malaysia is one precious value I take after my dad. We share the same enjoyment trying different cuisines whether or not they are the familiar to us, checking out new places, exploring different cities like the locals, strolling at one local bazaar after another and especially getting spoilt for choice when it comes to food. 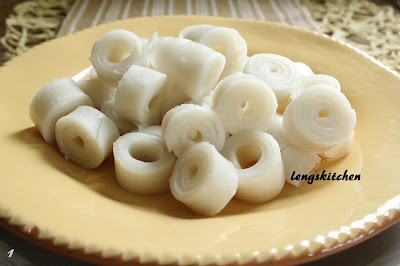 It was during those trips of ours to Kelantan that I was briefly introduced to Kelantan culinary delights. And the rest of the story - they simply unfold and develop themselves there onward. 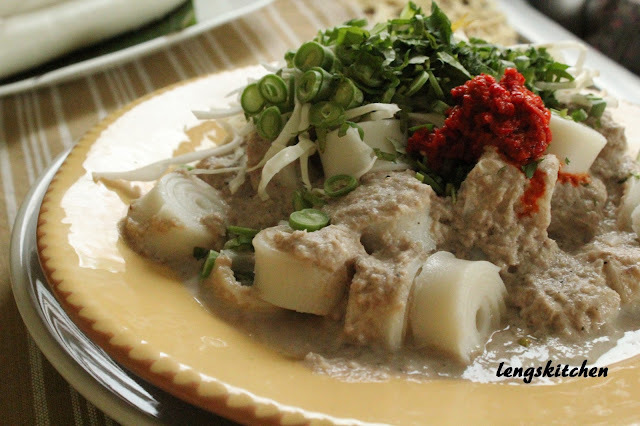 Of the extensive list within Gertrude's introduction post that reveals some the most famous dishes in Kelantan with good details, my attention kept getting diverted back to one single dish among them - the laksam. Oh, how I've missed it! Made famous in the East Coast particularly in (but certainly not limited to) Kelantan and Terengganu, it is a local favorite for many, even for a Kuantan folk like me. The difference between the laksam of both states? Not much really... they closely resemble one another especially in term of appearance. 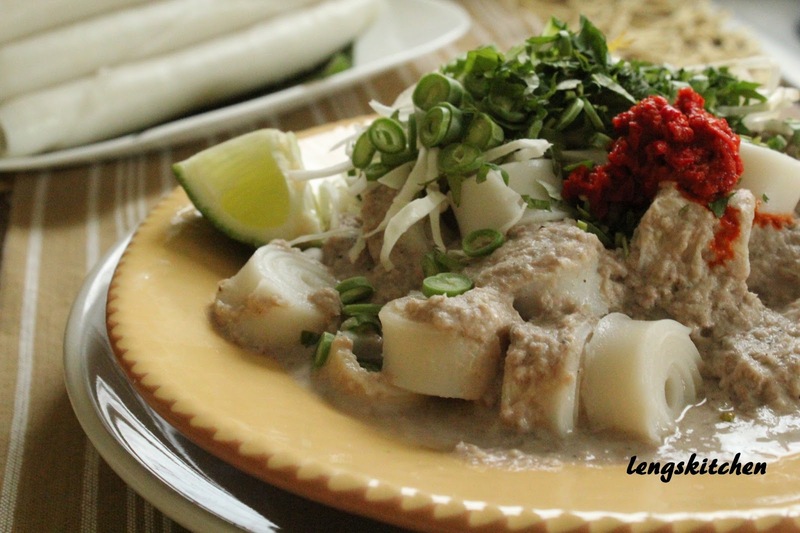 The only difference (but maybe not so notable after all) is probably how the Kelantan laksam tends to be a little sweeter in taste whilst the Terengganu version - a little more savory in general. I have not an exact recollection as to when and where I had first tried the laksam, but it has always been one of the few dishes in my "lookout" list especially during the Ramadhan months with food bazaars springing to life everywhere. Having not had it for so so long, that post was all needed to first get me so intrigued, and then all motivated to check the laksam out a little more. That, plus some extra readings especially on its making and I'm all decided - this is it! I shall give it a try making my own at home! 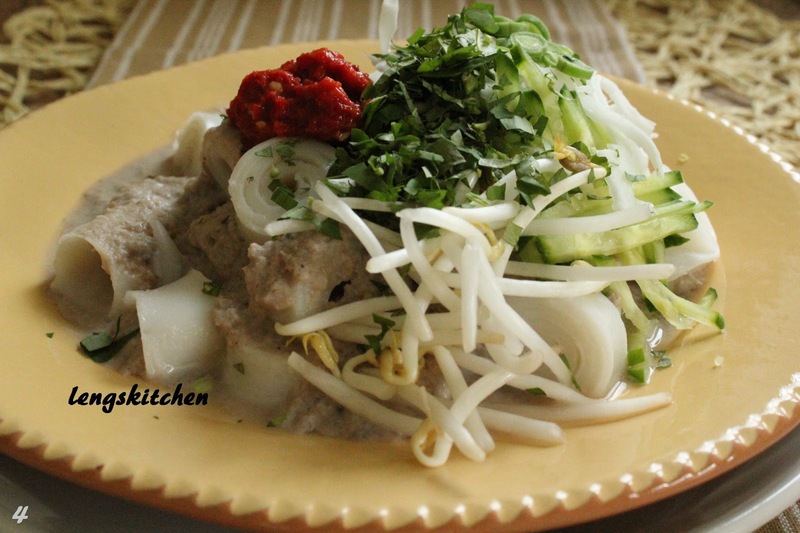 Breaking the laksam down to its components, we have the laksam gravy, the noodle, the ulam (a mixture of fresh herbs and salad eaten raw) and the sambal. 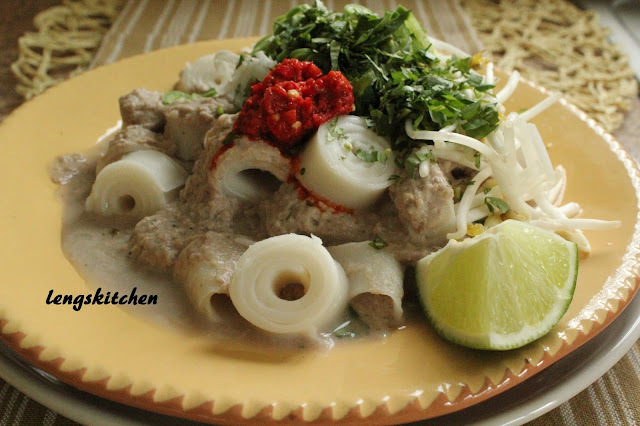 A brief look at it - it is generally a serving of rolled up flat rice noodles drenched in a rich and relatively thick white gravy, topped with a variety of ulam and finished with a huge dollop of sambal (and a squeeze of lime!). 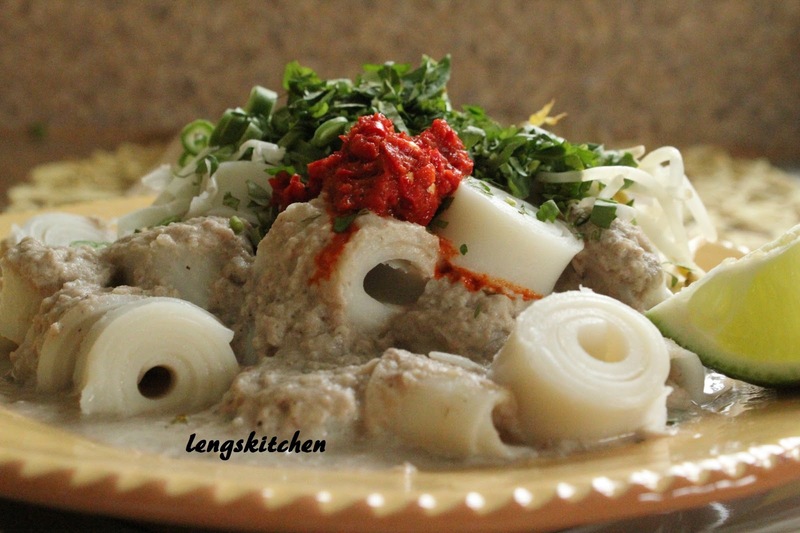 The rich and relatively thick white gravy - it is the centerpiece to a serving of laksam, pretty much defining the quality of the laksam in general. Made primarily with fish - first steamed, deboned and then pulsed into a paste, the gravy with a natural sweetness coming from the fish is then made creamy by adding in the coconut milk. Some of the choices of fish include the ikan kembung (Indian mackerel), ikan selar (yellowtail scad), ikan selayang or ikan tamban (both translated as sardine on the MalaysianFood.net in its glossary page). 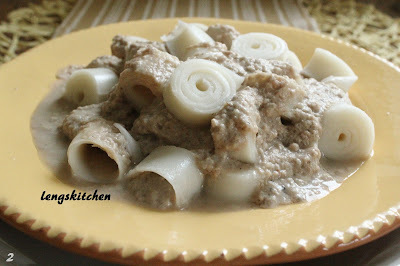 With some minimal spices adding in some aroma and tanginess to the gravy, its taste (and appearance) is accentuated and made even more unique with the use of black pepper powder and especially so when it is freshly and coarsely ground. The laksam noodle is made with a mixture of rice flour and wheat flour. 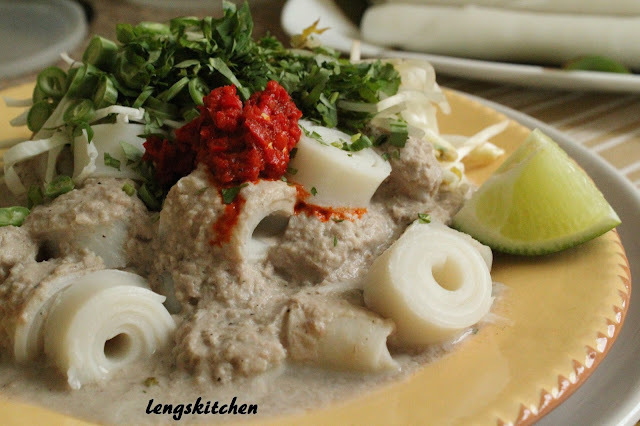 Slightly thicker than the usual flat rice noodle (kuey teow), making the laksam noodle has always been more like a homemade affair - they are almost never seen or sold readily made and packed in the market unlike all the other easily available types of noodle. 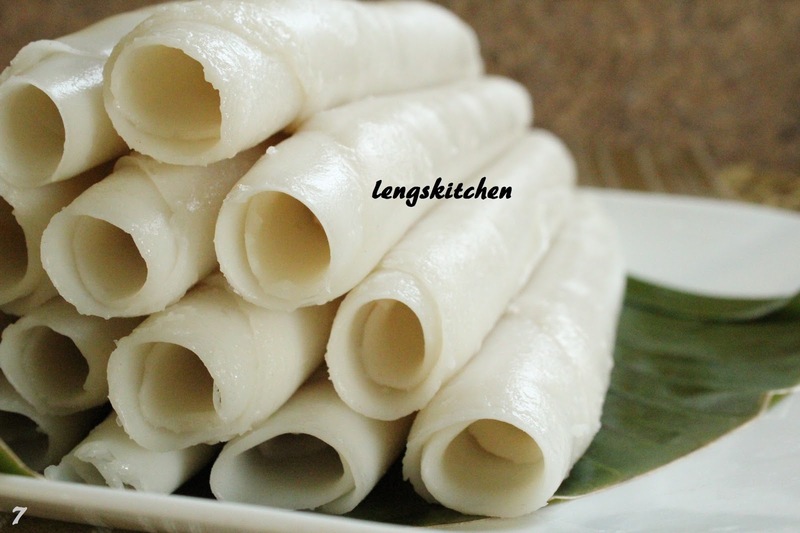 From a smooth batter, a small amount is spread in a thin layer and steamed to set. As it cools, it is rolled up neatly and cut to bite sized right before serving. Soft with a tad of springiness, they should neither be too thin or too thick in texture. The ulam made up of different types of vegetables and herbs makes a great source of fiber that completes the laksam in terms of its nutritional value. It is also the garnishing that does the rest - it adds color, complements the aroma and enhances the taste. 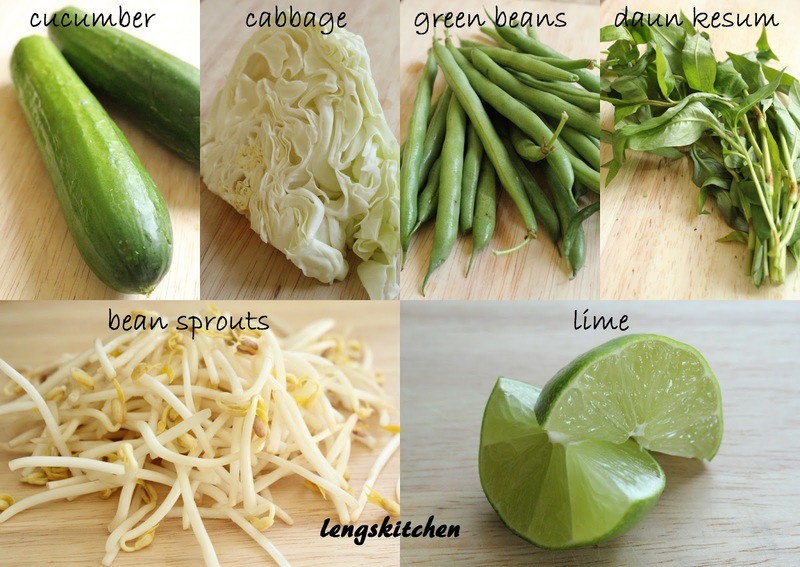 Some commonly used greens that make great candidates for this ulam include the bean sprouts, cucumber, long beans, daun kesum (Vietnamese coriander) and bunga kantan (torch ginger bud). 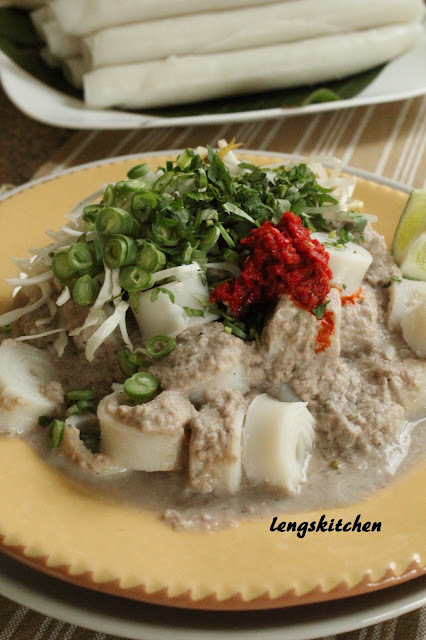 Served raw (some julienned, some thinly sliced, others serves as it is), the ulam adds a contrasting flavor and texture with an extra crunch to a serving of laksam. And for the finishing touch - the sambal! 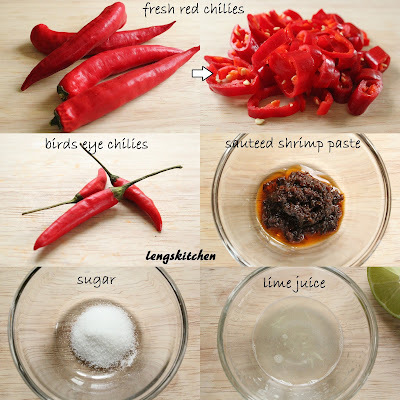 Made with fresh red chilies and some birds eye chilies for an extra kick, it comes with a hint of piquancy from the shrimp paste (belacan) added in. A plate of laksam now completely transformed visually with the vibrant red of sambal - with a grandiose squeeze of the fresh quartered lime to wrap things up... the laksam's all done! 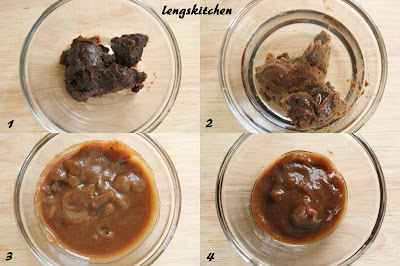 Add 2 tbsps of tamarind paste to 1/2 cup of warm water. Squeeze to extract the tamarind juice, discarding the seeds/pulp after that. 1. 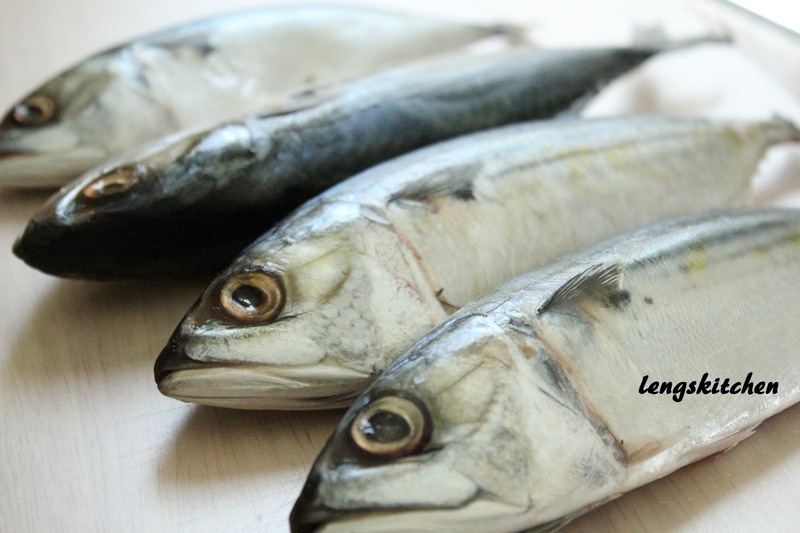 To poach the fish, fill a large skillet with a cup of water. Add in the asam gelugor (or tamarind juice). 2. 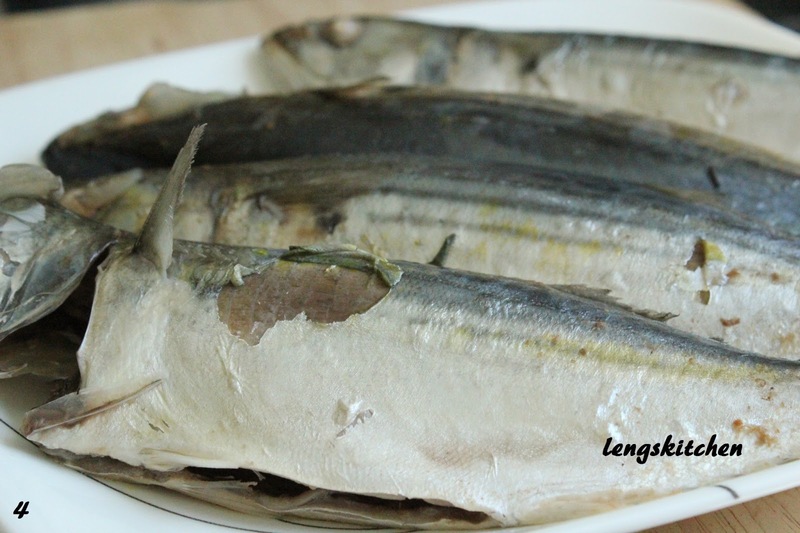 Line the fish in a single layer. 3. Add in a pinch of salt over them. Bring to boil on high. 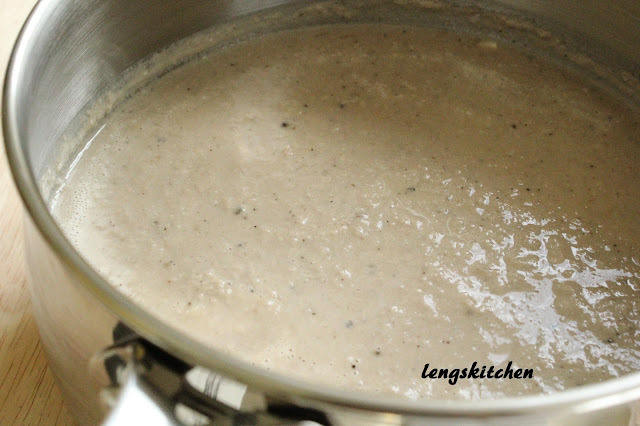 Once bubbling, turn the heat down to medium-low, cover and let simmer for 5 minutes. The fish should be just done by then. Remove the skillet from heat. 4. Gently transfer the fish onto another plate and let cool completely. 5. Strain the poaching liquid through a sieve and retain the liquid. To this retained liquid, add in just enough water to mark up to 350ml. Set aside. 6. Once cooled enough to handle with hands, debone the fish and set the fish meat aside. 7. 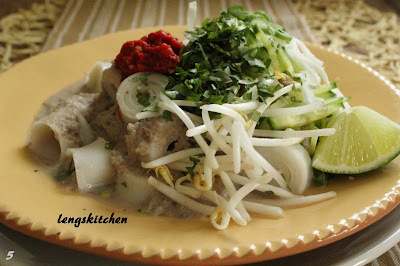 In a food processor, bring together the fish meat, ginger, garlic and shallots. Blend on high until they turn into a thick paste. Remove and set aside. 8. In a sauce pan set over high, pour in the coconut milk. Add in the asam gelugor (or tamarind juice) followed by the water and the fish paste in (7). Stir to mix everything well and bring the content to boil. 9. Add in freshly ground black pepper powder and stir well. Finish with adding salt and sugar to taste. Remove from heat and set aside. 1. 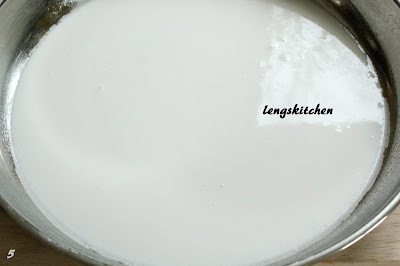 In a mixing bowl, add in the rice flour followed by the all-purpose flours. 2. Add in the salt next. 3. Pour in the warm water, and mix the content with a hand whisk until well combined. 4. Set the steamer ready with enough water. Lightly grease a round steel plate and place it on the steamer rack. 5. Scoop in some batter using a ladle, just enough to form a layer neither too thin nor too thick. Cover and steam on high for 3 minutes. 6. Remove the plate from the steamer and let cool lightly for about 30 seconds. Lightly scrape the side to slightly loosen up. 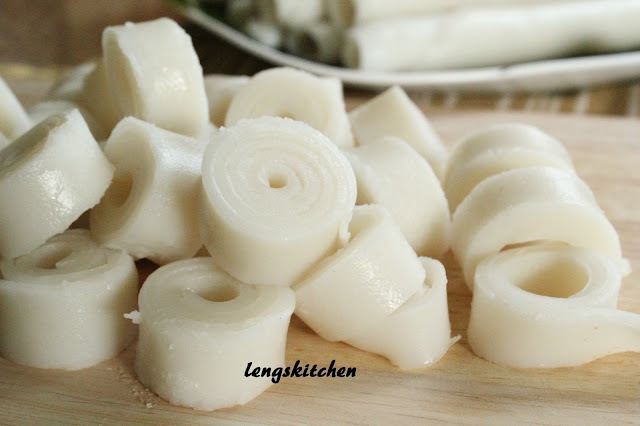 While the noodle sheet is pliable still, roll the noodle tight and neat starting from one end. Set aside on a plate. 7. 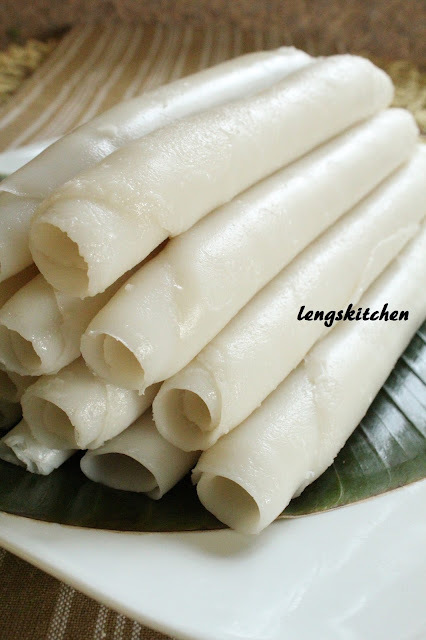 Regrease the plate lightly (it doesn't have to be cleaned prior to reusing) and repeat with the rest of the batter. 1. 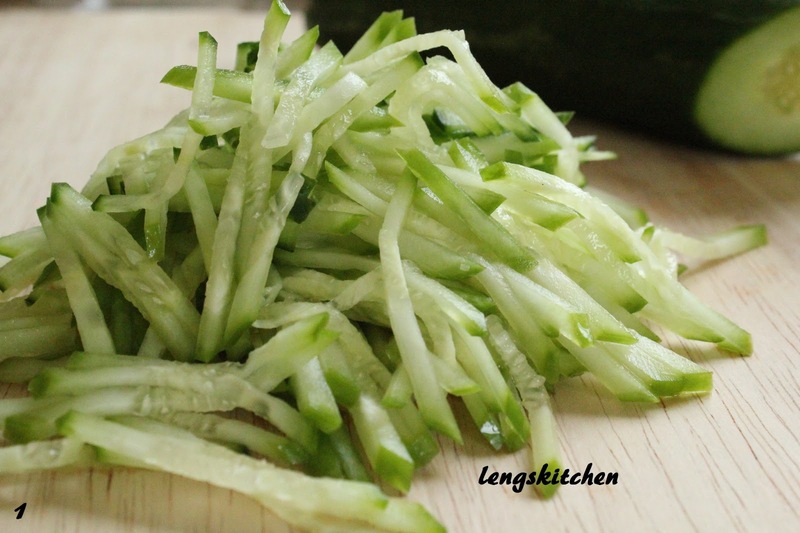 With the cucumber, trim the ends, thinly slice and julienne. 2. 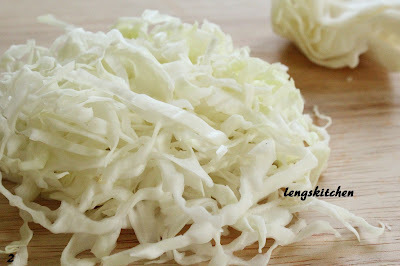 Slice the cabbage thinly. 3. 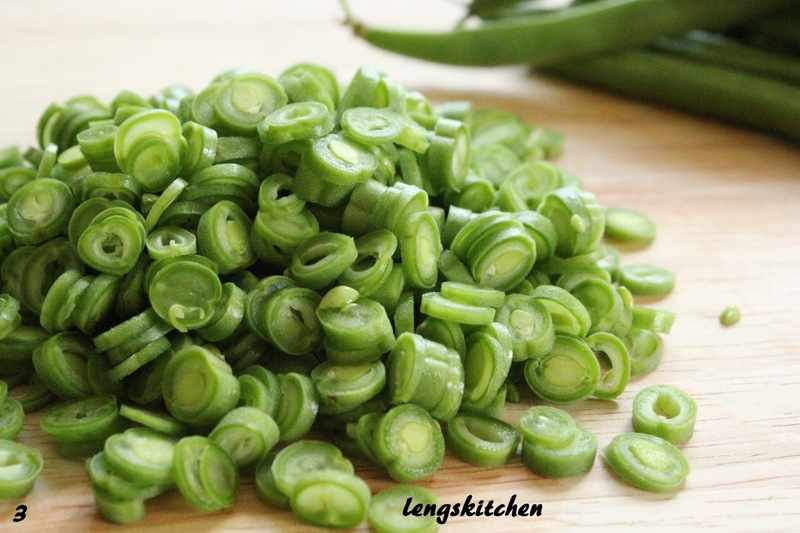 Trim the ends off the long beans (or green beans) and thinly slice them. 4. 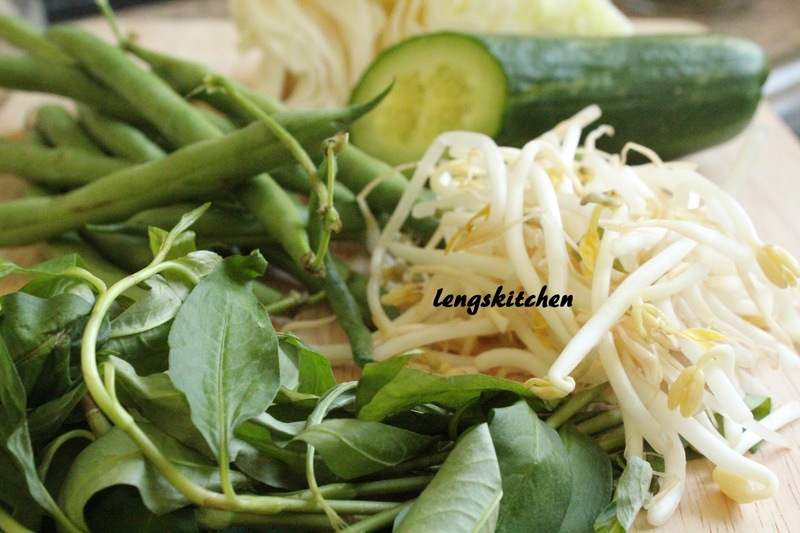 Arrange the daun kesum in a small bundle. 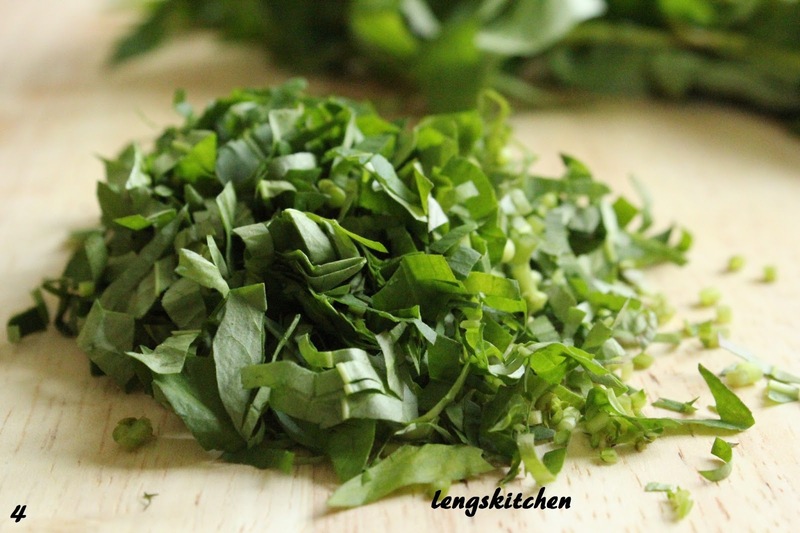 Trim the hard ends off slightly and thinly slice the coriander crosswise. 5. 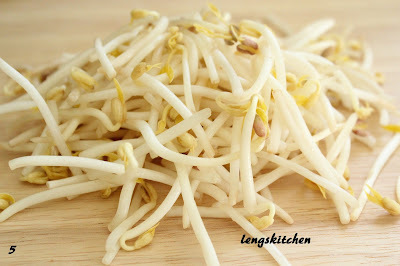 Trim the ends of the bean sprouts, rinse, drain and leave to dry in a colander. 1. In a mini food processor, blend the chilies and shrimp paste together. 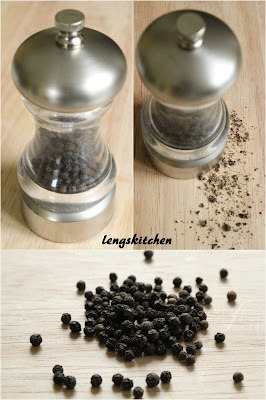 Likewise, it can be pounded using the mortar and pestle. 2. Transfer the blended ingredients into a small bowl. Add in sugar and lime juice. Stir to mix well. 1. Separate out an individual portion of the noodles. Cut them into bite-size pieces (slightly less than an inch a piece). 2. Ladle in just enough warm gravy to cover the noodles comfortably. 3. 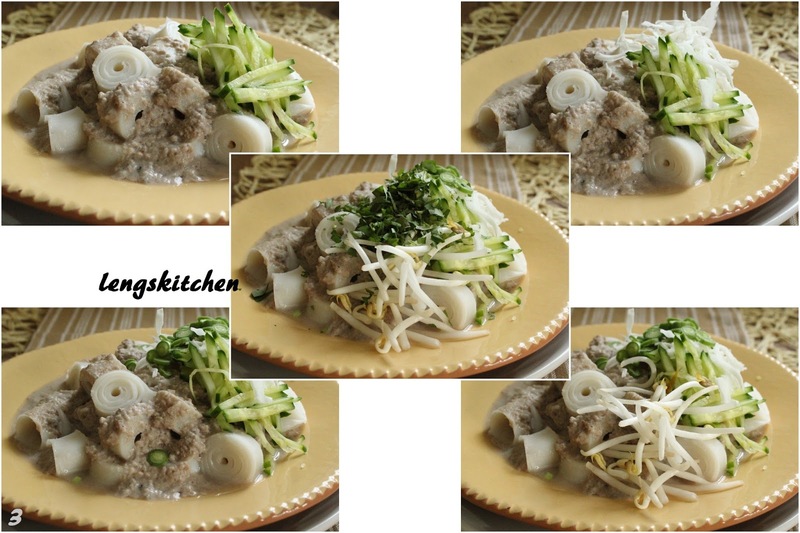 Arrange the ulam on top of the noodles or on the side. 4. 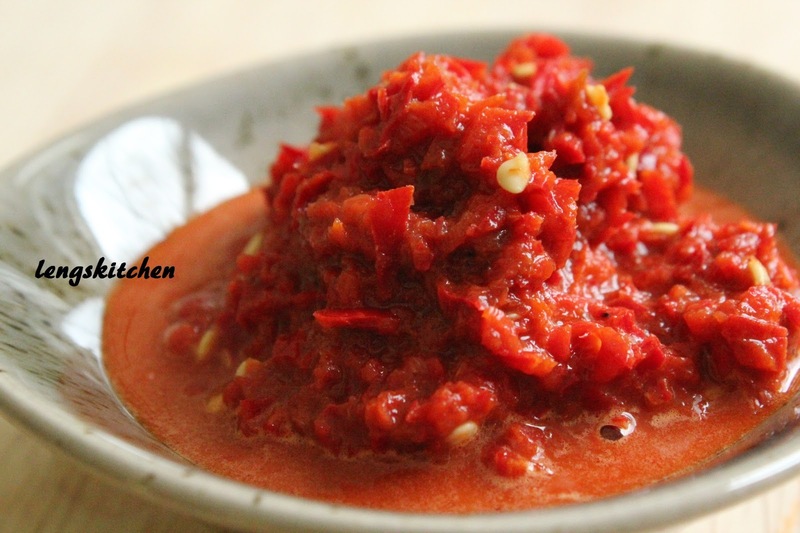 Add a dollop of sambal on top. 5. Serve with a wedge of lime on the side and serve warm. 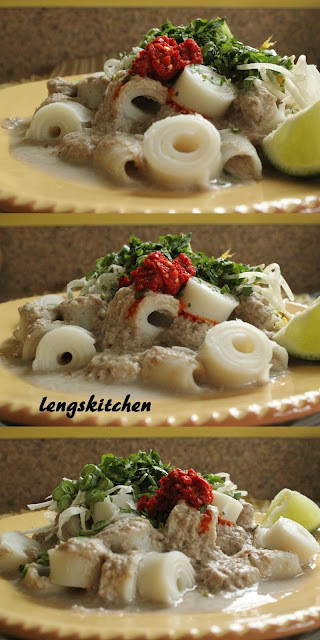 I am submitting this post to Malaysian Food Fest, Kelantan Month hosted by Gertrude of My Kitchen Snippets. You put in so much effort to cook this dish. The look awesome. I never taste this dish before. Maybe one day when I am hardworking I will try it out. Thanks for the support and participating in the MFF event. Thank YOU for hosting it! That's where I got all motivated :) It was quite a lot of work (but mostly because of the many breaks from work for the camera too lol) but I had some real fun! Thanks again and good luck with the event! Bravo, nice explanation and photos.